Instead, he says he'll be staying in the USA - for fear of assassination in the UK. The 26-year-old New York Knicks centre explained to Radio 1 Newsbeat why he's cancelled his appearance at the O2 arena on 17 January. "The Turkish government is obsessed with me," he said over the phone from his New York base. "I speak out against [President] Erdogan, and so I don't feel safe. "It's sad as I love Harry Potter, and wanted to come see all of London so badly, but I can't take the risk." As things stand, Kanter's Knicks team will go ahead and play their regular season game against the Washington Wizards without him. Their game in London is part of an NBA strategy to bring the sport to the world - but ironically it can't bring one of the world's best players. The sportsman has referred to the politician as "the Hitler of our century". "I'm not saying that Erdogan's going to do an operation [against me] in London but it's more there are lots of crazy supporters of his. "You can say that I'm paranoid but I don't want to take the risk. "My team's security said to me 'If you go, you can't leave your room or do any activities for the time you're in London'. "I'm getting more death threats, hundreds in the last few days. But I won't stop being outspoken I want the whole world to know what's going on in Turkey. "It's bigger than basketball, it's bigger than the NBA." Kanter is caught up in a Turkish political conflict which has spread beyond his home country's borders. Kanter, who was educated at one of Mr Gülen's network of schools in Turkey, has taken the cleric's side. The basketball player regularly visits Mr Gülen at the cleric's home in Pennsylvania. Kanter's moves have come at personal cost. In 2017, the sportsman's father Mehmet was arrested in Turkey and charged with membership of a terrorist group. "It's very sad," he said. "I haven't talked to my parents for a long time. I tried bringing them here but the Turkish government wouldn't let them." In 2017, the Turkish government cancelled Kanter's passport, forcing him to cut short a planned trip to Romania and return to the US, where he is a permanent resident and due to get citizenship in two years. Mike Bass, a spokesman for the NBA, told the BBC: "The NBA has played hundreds of games outside of the US and this is a very unique and unprecedented situation." 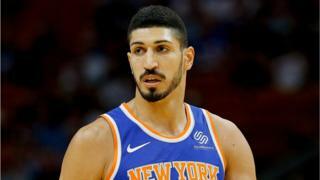 The New York Knicks say Kanter's decision not to travel to London is based on visa issues, not security. "I genuinely am worried about my safety and so are my [security] team. It'd be helpful I guess if the Knicks came out and said it." The Knicks haven't respond to Kanter's denials that this isn't related to documentation. The UK's Home Office says that it won't comment on individual cases. "If I hear any reassurance from the British government, maybe I'll talk to my team again."